Lacy sleeve cuffs and dainty roses around the neck adorn a darling baby cardigan worked in shell stitches. 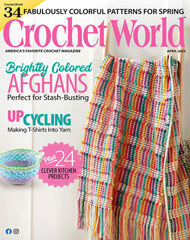 This free crochet baby pattern was originally published in the April 2012 issue of Crochet World magazine. Size: Includes child's 12 months through 24 months. Made with size 3 crochet cotton thread and size F/5/3.75mm hook.